We were tagged by our friend Chef to put up something creative that is done in our house. 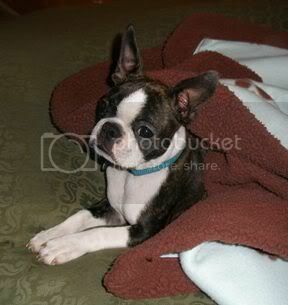 (We will have Peanut put up the link to Chef's blog since we do not know how to do it.) Grammie (who is my mom and Peanut's Grammie) loves to knit. She isn't very good at it, but she likes it all the same. She has a favorite yarn shop called Knit Divas. (They even have a online store.) 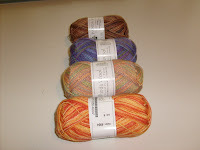 They have lots of very colorful yarn in all sorts of types. Grammie had been knitting off and on for years. She made hats and slippers mostly. 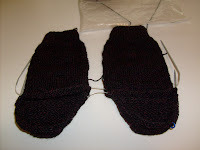 One day she decides that she is going to take a class on Knitting 2 Socks on 2 Circular Needles. We are all saying to each other, RIGHT. She goes to the class and finds out that she has been doing something called a purl stitch wrong for like a zillion years. 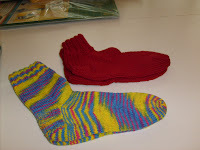 Jeannie the owner of Knit Divas got her straightened out and off she goes making socks. She has a pair that she is working on right now. They are pretty hard to see so I will put up a picture of some she has finished. She is working on a project now that she feels might be the death of her. 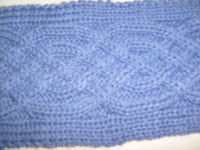 It is called a cable stitch. She has ripped it out more times than I can count and she uses HBO words when she works on it. It is a scarf and she is not sure if she will ever get it done. She has made hats and scarfs for Christmas gifts and even made Peanut's dad some beanies and helmet liners that he can wear in Iraq. (We love you Peanut's dad). You should see all the yarn that she has sitting around. That is only a few of the skeins that she actually has hidden. Like she is going to finish all these projects by the time she goes to the Rainbow Bridge! That is our creative post and we hope all you pups, kitties and hammies have the greatest day. well mom can't even knit so even if grammie was doing it wrong she was still doing better then mom. But then mom can make soap and we don't think grammie can do that. We hope you have a great day also. Your Grammie is soooo talented! That cable stitch looks mucho hard. We think she is super sweet for sending Peanut's daddy a present in Iraq! My silly sister Paris said to tell Dawson "hello". Cool projects. 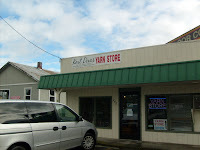 There is a yarn store near our house, but our mom is clueless when it comes to anything that you might make with yarn. They have pretty stuff in the window of the store though. So you asked us if we will get to drive the clubhouse. That would be really cool, right? Unfortunately, Mom and Dad said they are going to take the ladder down so we can't get on top of the clubhouse. They think that the vet already gets too much of their money, so they try to eliminate any way we could get hurt. How boring! Yes, your Grammie is very talented! My mom is left handed so when my grandma tried to teach her how to knit she had a hard time! My mom learnt but she twist the stitchs! Grammie uses HBO words? I can't believe that! You might have to wash her mouth out with some of the soap from Peanut's Mom (come to think of it, I might need some of that soap for my Mom. She swears like a pirate. My Dad says it isn't very "ladylike" but she doesn't care). Your grammie is so talented! It's really sweet of her to send Peanut's dad a gift too! My human would have NO idea how to knit. Her Mom passed away when she was little, like a quadrillion years ago, and she had a knitting bag and needles so we guess she liked doing that stuff too! The cable knit looks really hard but very pretty. Mom would probably just buy all the yarn too and then just look at it! I bet its fun to just shop and look at all the cool colors! Mom is drooling over that yarn store! She says visiting one of those is like going into a candy store! What awesome socks and we just love that beautiful blue cabled scarf! Mom does the purl stitch backwards and one day she found out that it was the European way! I bet your Grammie isn't doing anything wrong, Moco! Oh the servant adores the yellow stripy socks!!! Your knitting is beautiful and VERY creative! 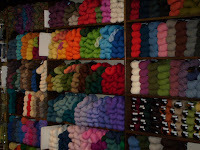 And we would like to curl up and stay toasty in that warm yarn in that store, yes we would! My grammie knits, too, and I've seen that cable stitch before; it looks great to me! Unfortunately, motch did not inherit any of grammie's talent and she's very uncreative. Has Grammie made you some slippers yet, Moco? Grammie is one talented lady! My ma ape says that knitting is totes cool but she's lucky to dress herself in the morning, let alone MAKE herself something to wear. Hi Moco, you've been tagged! Have fun! That knitting is just gowgeous..when Mommi was in second gwade in Switewland, evewyone had to leawn how to knit socks(boyz too), but she fowgot a lot of it and is genewally lazy..you'we vewy lucky to have someone who is so clevew!!! Moco, my mommy is so impressed with Grammie's knitting. It is truly beautiful and she is a most creative lady. Well worth the wait. And I think they look good enough to eat!! 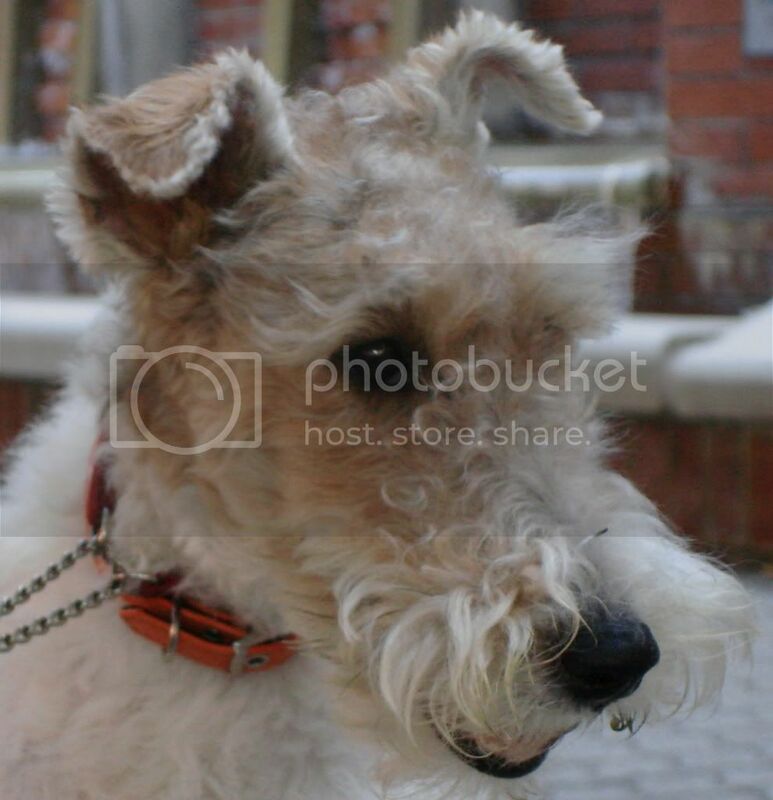 My name is Koobuss and I am a wire fox terrier. Thank You for visiting my blog. Glad you like the hat contest winners. It was a lot of fun. Years ago when she was still working and long before my time, my mom learned how to knit. She loved it and spent hours upon hours knitting, making everybody she knew (almost), at least one sweater. She even knew how to do the cable. Her biggest problem was keeping the yarn from tangling. Seems she spent as much time undoing tangles as she did knitting. As she grew older, her hands began to hurt. Then one day she bought a computer. Once she got on the internet, that was the end of the knitting, and the needles, and the yarn, and the pattern books, and the etc.